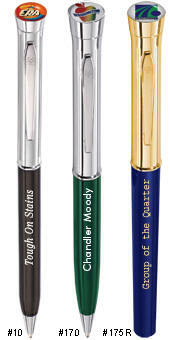 When you select a writing instrument from our Monogram Collection, you will celebrate any occasion with taste and flair. These distinctive writing instruments feature a polished golden or chrome cap accentuated with hand-etched lines. This intricate detailing is complemented by a high gloss barrel offered in four outstanding and regal colors: dark green, burgundy, dark blue and black. With personalized engraving on the barrel, make your mark by choosing a Monogram!